For Newton's proposal that light is emitted from luminous objects in the form of particles or corpuscles, see Emission theory. In the fifth century BCE, Empedocles postulated that everything was composed of four elements; fire, air, earth, and water. He believed that Aphrodite made the human eye out of the four elements and that she lit the fire in the eye which shone out from the eye, making sight possible. 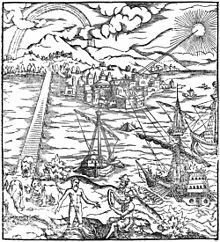 If this were true, then one could see during the night just as well as during the day, so Empedocles postulated an interaction between rays from the eyes and rays from a source such as the sun. Around 400 BCE, emission theory was held by Plato. Around 300 BCE, Euclid wrote Optica, in which he studied the properties of light. Euclid postulated that light travelled in straight lines and described the laws of reflection and studied them mathematically. He questioned that sight is the result of a beam from the eye, for he asked how one sees the stars immediately, if one closes one's eyes, then opens them at night. Despite being similar to later particle theories, Lucretius's views were not generally accepted; light was still theorized as emanating from the eye. Ptolemy (c. 2nd century) wrote about the refraction of light and developed a theory of vision that objects are seen by rays of light emanating from the eyes. Galen, also in the 2nd century, likewise endorsed the extramission theory. Due to his medical authority, his view held considerable influence in Europe for much of the following thousand years. Adherents of emission theory cited at least two lines of evidence for it. The custom of saluting is said by some to stem from the habit of Greek soldiers putting their hands up in front of their eyes to "shade" their eyes from the powerful "light" shining from the eyes of their commanders. The light from the eyes of some animals (such as cats, which modern science has determined have highly reflective eyes) could also be seen in "darkness". Adherents of intromission theory countered by saying that if emission theory were true, then someone with weak eyes should have his or her vision improved when someone with good eyes looks at the same objects. Most argue that Euclid's version of emission theory was purely metaphorical, highlighting only the geometrical relations between eyes and objects. The geometry of classical optics is equivalent no matter which direction light is considered to be moving in, since light is modeled by its path, not as a moving object. Measuring the speed of light was one line of evidence that spelled the end of emission theory as anything other than a metaphor. Alhazen was the first person to explain that vision occurs when light bounces on an object and then is directed to one's eyes. Winer et al. (2002) have found evidence that as many as 50% of adults believe in emission theory. ^ Beare,John Isaac "Greek Theories of Elementary Cognition from Alcmaeon to Aristotle" Publisher: Lulu.com, Mar 16, 2010 (p.14-23). ^ Wong, Darren; Boo Hong Kwen (2005). Shedding Light on the Nature of Science through a Historical Study of Light (PDF). Redesigning pedagogy: research, policy, practice. Archived from the original (PDF) on October 8, 2011. Retrieved July 17, 2011. ^ Doesschate, G. T. (1962). Oxford and the revival of optics in the thirteenth century. Vision Research, 1, 313-342. ^ Winer, G. A., Cottrell, J. E., Gregg, V., Fournier, J. S., & Bica, L. A. (2002). Fundamentally misunderstanding visual perception: Adults' beliefs in visual emissions. American Psychologist, 57, 417-424. . This page was last edited on 20 February 2019, at 15:00 (UTC).